RIO DE JANEIRO — No matter how many Olympics Greg Harney attends, it is always the athletes from his alma mater who catch his eye. Rio is Harney’s 18th Olympics as either an international consultant, organizer or fan, but the 1977 Arizona State graduate continues to monitor his fellow Sun Devils every chance he gets. Harney originally envisioned making it to the Olympics as an athlete, leaving what he called “the farm towns of upstate New York” for Arizona in 1974. However, not long after arriving in Tempe, he shifted gears from athlete to sports professional. Harney graduated from ASU with a degree in physical education. He worked for Sun Devil Athletics as an assistant sports information director until 1982. He was with the track team when the Sun Devils won their only men’s track and field national championship in school history in 1977. “I still say the greatest day in Arizona State history was when we beat UCLA in track and field by two points, we beat USC in baseball and then we beat (University of Arizona) in basketball,” Harney said. Harney now works as a consultant for Cartan Tours, a California company that coordinates events, hotels, transportation and other accommodations for people attending the Olympics from countries around the world. According to the company’s website, Cartan is the exclusive authorized ticket reseller for 36 countries and territories in Rio in addition to organizing hotel and travel packages. 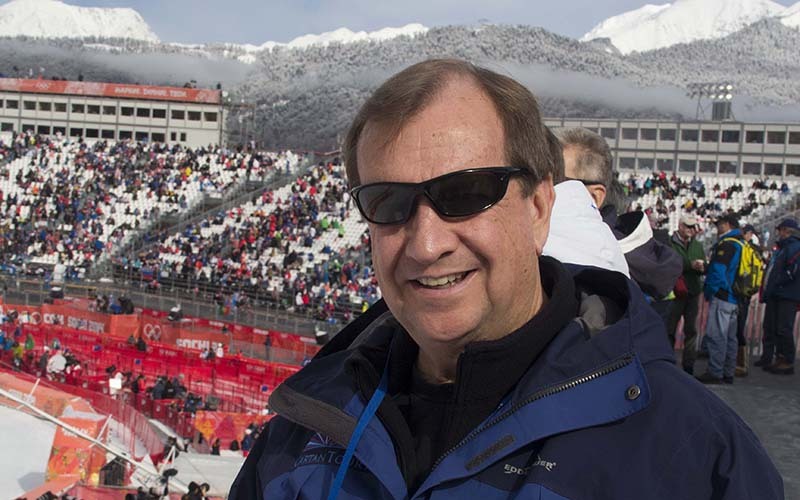 Harney’s professional Olympic experience began in Los Angeles, when he worked as the manager of venue press operations for the 1984 Games in the city. After those Olympics, he went on to spend nearly 20 years working for the USOC, ultimately becoming the organization’s managing director of international affairs before departing in 2005. “I often would joke that I worked for the U.S. Olympic Committee for 30 years but only got paid for 20,” Harney said, referring to the frequent late nights and weekend work that came with his job. Harney’s son Michael, who also works for Cartan, has joined him here in Rio. This is Michael’s third Olympics after helping in Beijing and London. Harney is always traveling, saying he’s even busier in a non-Olympic year than an Olympic year as Cartan is always working to partner with countries and begin planning for the next big sporting event. “My profession is also my hobby, and not a lot of people get to have that opportunity,” Harney said. Harney said he has a laundry list of highlights from his three decades of involvement with the Olympics, but it is hard to pin down just one that stands out the most. “I got a memory from every one of them, and one day I really need to put them down in a book,” Harney said. Harney is hoping to make it to Pyeongchang for the 2018 Winter Games and then reach his 20th at the 2020 Summer Games in Tokyo.